XXXTentacion Was Reportedly Rejected for Grammys In MemoriamDue to the allegations of his domestic violence. Surviving R. Kelly and the Problem With Modern Fan CultureMany of the biggest success stories of the last year in music involved men with volatile histories. The Trouble With XXXTentacion’s Fragmented SKINSIt’s all chilling ideas that dissipate before they can be resolved. 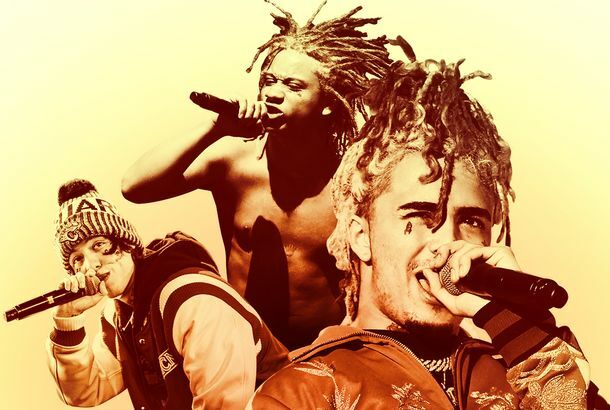 The Gatekeepers of SoundCloud RapThe music industry is transforming to accommodate stream-focused, controversial, and very popular new rappers. Here’s how. Posthumous XXXTentacion Album Coming Next MonthIt’s titled Skins. Terrence Malick Is Making a Documentary About Lil PeepHe’s a friend of the family. New XXXTentacion Song Released Days After Confession Tape SurfacesLil Pump has released a posthumous collaboration with X co-produced by Skrillex. Kanye West’s Relationship to the Internet and Also Twitter Is Not GreatHe sees the web as a platform devoid of the messy particulars of real life. Kanye at It AgainThe Fader, however, edited his remarks on Donald Trump and Alex Jones. Four Charged in XXXTentacion MurderPolice are still searching for two of the men indicted by a grand jury Wednesday. XXXTentacion Signed Massive Record Deal Prior to His Death$10 million, to be exact. XXXTentacion Gets First Posthumous No. 1 Hit Since Notorious B.I.G.The song jumped from No. 52 to the top spot on the Hot 100 following his death. How to Pronounce XXXTentacion’s NameAs popular as he was, no one seemed entirely sure. The Complicated Life and Death of XXXTentacionThe cruel figure he played on the harsher records in his short catalogue lined up with violence he encouraged and visited on others in real life. The New Wave of Rap Violence Shouldn’t Be IgnoredYoung artists like XXXTentacion, Kodak Black, and Tay-K are making popular music, but their real-life violent actions can’t just be glossed over. The Complete History of XXXTentacion’s Controversial CareerThe musician underwent a tumultuous series of legal problems and big-money label deals prior to his murder. XXTentacion Dead Following ShootingTwo arrests have now been made in the shooting. Spotify Is Scrapping Its Artist Conduct Policy XXXTentacion will be put back into playlist circulation. Report: Spotify Might Put XXXTentacion’s Music Back on PlaylistsReps for Kendrick Lamar allegedly called Spotify’s CEO and threatened to pull his music in response to the new policy change. Spotify, R. Kelly, and the Music Industry’s Slow Push Toward ChangeSpotify’s new policy is heartening, but it obscures a deeper problem in contemporary media consumption. What Spotify Removing R. Kelly and XXXTentacion From Its Playlists MeansThe streaming platform banned both artists from its playlists, but what does that mean for the music industry at large? How to Tell All the SoundCloud Rappers ApartFrom the face tattoos to the crimes to their confusingly similar names, we’ve got you covered. SoundCloud Rap Has Its First No. 1 Album — Now What?XXXTentacion’s chart success seems significant, but it might be the first step toward nowhere for SoundCloud rap. 8 Best New Songs of the Week: Courtney Barnett, Halsey, Hayley Kiyoko, KygoCourtney Barnett has written her best song yet. Lil Pump Responds Bizarrely to a Bizarre WorldExploring the sources and viral success of the South Florida sound. The Judgement of XXXTentacionHe wouldn’t be where he is if he wasn’t very good at making it very clear who he is.